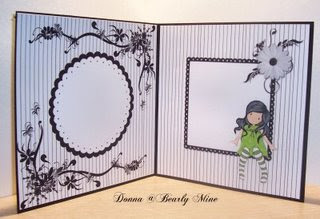 Stamptacular Sunday Challenge: Challenge #3: Black and White + ONE! Feel free to put our LOGO on your blog! 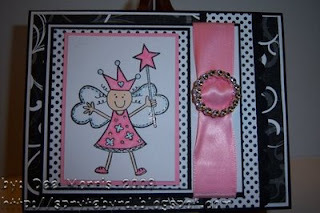 STAMPTACULAR TUTORIALS! Do you have a tutorial you'd like to share? E-mail misscill@yahoo.com. Challenge #3: Black and White + ONE! 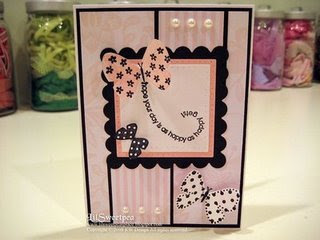 It's that time again...time for another Stamptacular Sunday Challenge! "Black and White + ONE!" For this challenge your entire project must made with black, white and ONE other color! 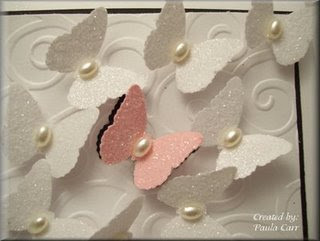 This includes any papers, inks, and any other embellishments you might want to add. 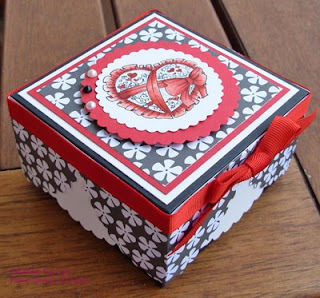 Oh, and don't forget that you must also incorporate some sort of stamping on your project as well. Afterall, this isn't called the STAMPtacular Sunday Challenge for nothing! You are free to create whatever you'd like as long as you follow the requirements! The prize is TWO items of the winners choice from The Cutting Cafe! Please remember, in order to be entered in our drawing your entry MUST be original and created ONLY for our Stamptacular Sunday Challenge! 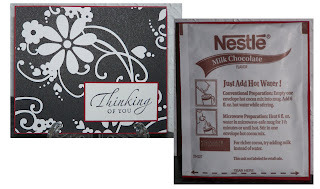 On the inside there's a Thinking of You card and a packet of hot cocoa. To enter your submission please add your name and DIRECT LINK URL into Mr. Linky below! PLEASE do NOT add your name to Mr. Linky unless you have completed this week's challenge and posted your submission on your blog or some other online gallery! However, if you'd just like to let us know that you've checked out our blog or want to comment on the DT submissions for the week, please feel free to leave us a comment in the comment section of this post. We'd love to hear from you! HINT: For a DIRECT LINK URL all you need to do is publish your submission on your own blog then click on the title of your post. Once the post is open just copy and paste the http:// address that is in your search engine. This will link your work specifically for THIS challenge and will make it easy for everyone to find it throughout the week no matter how many posts you've posted to your blog after your submission. Hope this helps! Oh, I'm the first one :)) Great challenge this week too and gorgeous work from DT ! sorry but my english is not so good ,I´m from germany. These cards are wonderful. Such an inspiration. 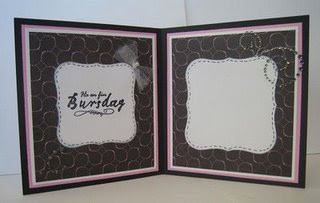 I am new to cardmaking and love to look at everybody's work. I just love this challenge!! Glad I could participate this week! What a wonderful challenge and the DT's cards are absolutely stunning!!! Hiya awesome DT cards very inspirational and so much talent love them. this is my first ever week joining in your challenges.. i loved doing it :). Thanks for another great challenge this week. The DT cards are beautiful! First time here. Love the different examples from the DT members. Great challenge girls and fantastic DT examples. Joanne - thanks for the message about my blog - I tried it again. Great challenge!!! black and white was the easy part but to add with it was a HUGE challenge for me. I had to come out of the box a bit.. :o) Wonderful DT team cards!! I really enjoyed this challenge...lovely cards from design team yet again. Heres a link to my card. 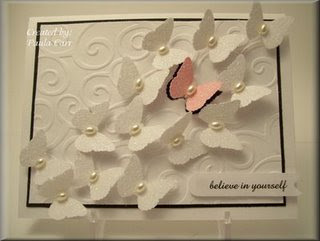 Great challenge & wonderful DT cards/projects this week, just stunning. Loved this challenge, and enjoyed looking at the DT's cards. 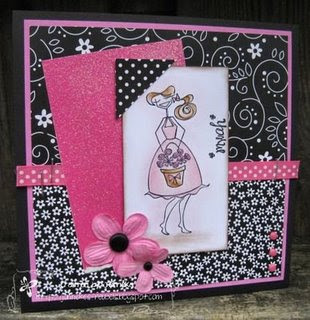 Great DT cards - I spent ALL week trying to think which 'One' to add to my Black & White!!! I am so disappointed I missed out on this challenge! I was sitting down to do it last night but I kept getting interrupted by my kids! Oh well! Loved the entries! Welcome to our Sunday Challenge Blog! 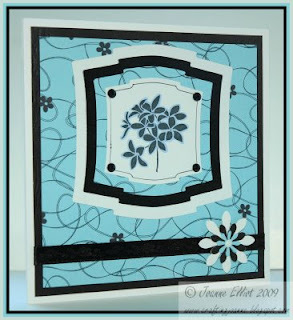 Every Sunday there will be a new stamping challenge posted. You will have until midnight on the following Saturday to complete the challenge in order to be entered in the drawing for any prize(s) that may be offered. In order to win the prize your submission MUST be original and follow the guidelines of the challenge. Oh, and by all means PLEASE feel free to combine our challenge with as many other challenges as you can! 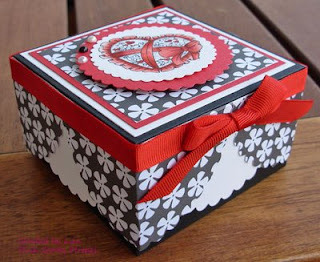 To join the fun please post your card/project on your blog and then add your name and direct link into our Mr. Linky. Any work posted on this site is the property of each artist. Please use any of the artwork shared here as inspiration only! Do NOT copy or replicate, in part or whole, any work here and claim it as your own for any reason whatsoever. Would you like to be a GUEST DESIGNER for our challenge blog? Participate in at least THREE challenges during the month, following all of the challenge requirements, and post a comment leaving a DIRECT LINK to your completed challenge each week that you participate. VOILA...you'll automatically be entered. At the end of each month we, the Design Team, will sift through all the qualified entries, narrow it down to our favorite three finalists and then take a final vote. The participant with the most votes will then become a Guest Designer for an entire month! Not only will you be spotlighted on our challenge blog for an entire month but you will also be given a Stamptacular Blog Award to post on your own blog letting everyone know you have been chosen as our Guest Designer! As a guest designer, you will be responsible for creating a challenge project each week for the month you are chosen. You will be given a list of all the challenges a month in advance and MUST then e-mail your completed submissions one week before they will actually be posted and spotlighted on our challenge blog. We hope that becoming a Guest Designer is something that will encourage more and more participants each week! Good Luck...but most importantly, please have FUN! Challenge #4: "Charmed, I'm sure!" HUGE ERROR and my APOLOGIES! Challenge #2: "This is for the birds!" OUR SPONSORS...Would you like to be a sponsor? E-mail me at misscill@yahoo.com!